Here we are, writing again, on a Monday morning. Life is just too busy at this time of year. We’ll make an attempt to get back to Friday mornings, this week. Some things in the garden are momentarily beautiful but that beauty may signal problems later on. Those gorgeous Crab Apples are the result of the even more gorgeous blooms that covered the tree in the spring. I have tried to find a good use for the fruit other than compost but have failed miserably. The Crab Apple jelly was awful. When I look out the window in the spring and realize that this is the alternate year when the tree is covered with a mass of pink blossoms, my appreciation of those blooms is tempered with the thought of having to gather up a few bushels of fallen fruit later in the year. The tree is directly over my ponds and if I’m diligent enough to scoop out the falling fruit on a daily basis then they don’t sink to the bottom and become part of the ooze. The ones that fall on the grass need to be raked and carried to the compost. I have tried and will again in the next week or so to pick as many as possible before they fall, it doesn’t save any time but it is a lot less messier. I think I’ve blathered on, more than enough, about the Crab Apples, I’ll just try to remember how beautiful they were in the spring. Other things are now ripening rapidly in the garden and one of them sends me out to support the pork producers of the nation. One of my true summer delights is a bacon and Tomato sandwich and they will be on my menu, almost daily, until the Tomatoes disappear from the garden. I’m often asked when to harvest Garlic. In my garden the answer is now. 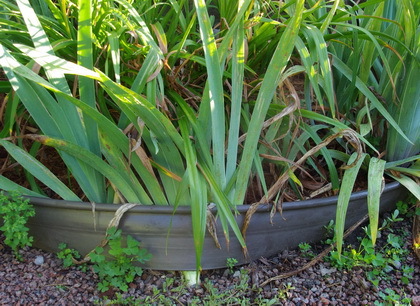 When the garlic plant has at least 2- 3 of its bottom leaves turning brown then it is time to dig it up. Once out of the ground I brush off as much soil as possible and then leave it in a sunny location for a few days so that it can dry and cure. The rest of the soil can then be brushed away and those large aromatic bulbs can be transferred to the cold cellar, waiting to infuse our winter meals with that wonderful aroma and taste. 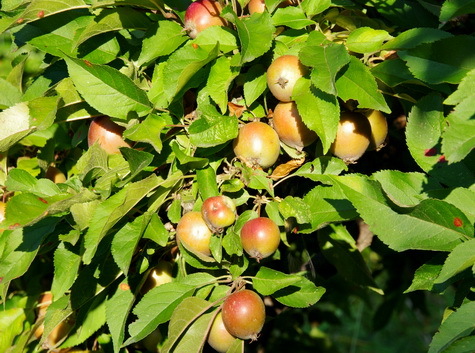 A few will re-emerge in mid September to be planted back into the garden for next year’s harvest. 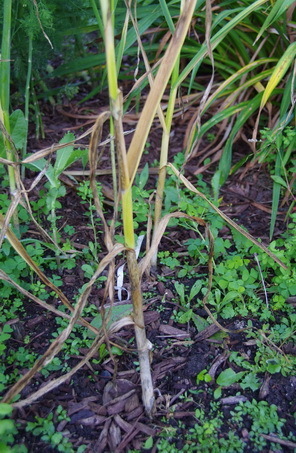 Garlic is one of the easiest things to grow in the garden if you observe one rule. They like their space. Each planted Garlic clove will produce a huge root system and needs about 20 cm (8") of space around it, to develop properly. You might notice a few weeds in that empty space. The biggest cause of small bulb production is the lack of sufficient space for each plant. I have tried many times to squeeze it into small vacant spaces in the perennial garden and it produces a reasonable stalk but the bulb is invariably too small. If I just listen to and observe the garden it will often tell me what needs to be done. It is the time of year to dig and divide Iris. The one in the picture that is pushing up the plastic edging is certainly telling me, not only that it is time, but also that it is one of the varieties, that needs to be dug this year. I haven’t finished the spring weeding and mulching yet and already it’s time to move into the midsummer activities such as the Iris dig. One of the reasons that I like to grow Iris is digging them in early August, when the pace in the garden is a bit slower, or at least it’s supposed to be. There are probably 10 - 15 large clumps that need to be divided this year and a few more that could be, but they will probably be ignored. I don’t have room for duplicates in my garden and I look with envy at some large gardens where whole drifts of one variety make a wonderful impact and statement. Then I realize that I used to have that much room and moved several years ago to escape the work involved in maintaining it. That leaves me with the problem?? of getting rid of the surplus Iris rhizomes. Neighbours appear and friends materialize and the surplus disappears and I’ve spread the beauty of my favourite perennial to a few more gardens. Sometimes I even generate a little income that might come close to paying for the dozen or so new varieties that I just had to have this year. Patricia Asks? I planted basil on july1. It came up very quickly but then stopped growing...Is there something I am doing wrong? Ken Answers! Basil is incredibly sensitive to cool temperatures and even a cool night or two can set it back noticeably. It also does not like the shade. Kathryn Asks? We moved here about 20 years ago. The previous owners (not gardeners) planted goutweed on the back slope. My question is : Has anyone ever lived long enough to get rid of goutweed? Ken Answers! I'm not dead yet but then neither is the Goutweed that creeps over from my neighbour:-) Good luck and keep digging. Dan Asks? I'm looking forward(not really) to the fall and wintering over some of my plants. I planted dahlias for the first time and have had great success with them. I want to save the tubers for next year. How and when should I remove them and is there any specific way to store them? Last year, I wintered over Gerber daises in the basement under grow lights they looked rather sad when I took them out is the spring. Once out in natural sunlight they "took Off". There performance exceeded my expectations and I am planning to winter them over again this year. They have however, outgrown the planter they’re in. How and when would you split them? Ken Answers! I dig my Dahlia tubers after the frost has knocked down the tops. I store them in a cool, 50F or so place, not in my cold cellar. They are in a cardboard box with a little SLIGHTLY damp or even dry peat moss. I start them up in pots about mid March. The Gerberas sound very interesting. I have no experience with overwintering them. I think they may be tough to split as they tend to grow from one large growing point. If you can see a couple of distinct crowns then chop away. I might try that just as I was bringing them out in the spring. Good luck. Pat My Siberian Iris's and Stella Daylilies are finished but my other Daylilies are still blooming and I need to divide them, is now a good time to do this or is the spring better? Ken Answers! Daylilies are very resilient and can be divided at any time but I would suggest that you wait until later in the month when they have finished blooming.